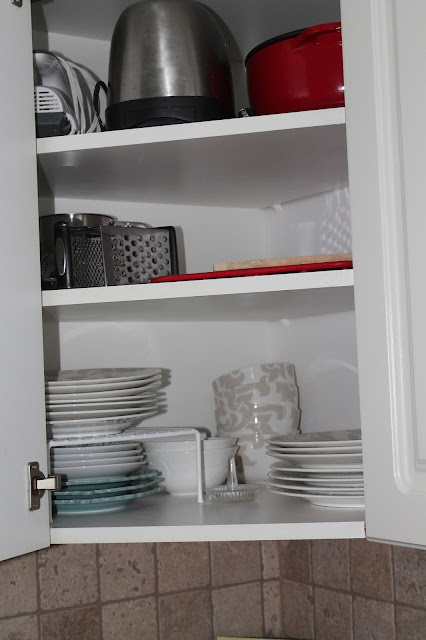 I'm back with part two of my month of kitchen organization! First, here are close ups of the chalkboard labels and the bin I use for my dry mixes. I use a chalkboard pen on these so the writing doesn't smudge as easily. Found these at Staples! I got a bunch of these stacking bins at the Container Store. I am using this on its own here. I still need to do something with that label though because it is pretty drab. I love these shelves. They helped us stack our plates better and gave us room in this awkwardasanything corner cabinet. Not a huge change in this drawer but I am always playing around to try to get more space. 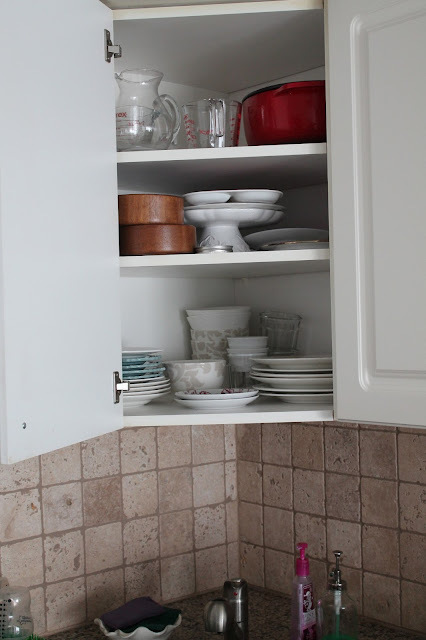 This under the sink cabinet was probably our biggest offender. I emptied it and got rid of a lot of never used cleaners, pet supplies, etc. One of these bins (from Target) holds our cleaning supplies for downstairs (I have an upstairs set too but that's a story for another day.) I can slide it out in the space left and carry it with me very easily. It also has extra Swifffer pads in it and gloves for easy access. The second bin holds our kitchen cleaning essentials: natural cleaner spray and Dapple, as well as Barkeeper's Friend and a dish rag. Next to that is our drying rack and dishwasher pods. I love that the pods come in such a nice litte container! This cabinet is annoying. It is long and stores most of our kitchen electronics. There really is no way to make this pretty so I just got rid of what we don't use and arranged things so they weren't piled on top of each other. And there you have it! Next month I am switching to Avery's bedroom which has become all sorts of scary! I can't wait to share it with you!